Symbian’s changed dramatically from the can-do culture of Psion Software. Within a few weeks, Randall had moved to be VP of Design, and Ericsson’s Kent Eriksson assumed operations. “We brought in Kent Eriksson to run things. From being an argumentative culture, we had a Swedish guy coming in and running it as a factory – we had a matrix management," recalls Randall. "Suddenly we were a grown up business. Pragmatically we realised it had to happen, but it wasn't an enjoyable process. It started to be a little less fun." 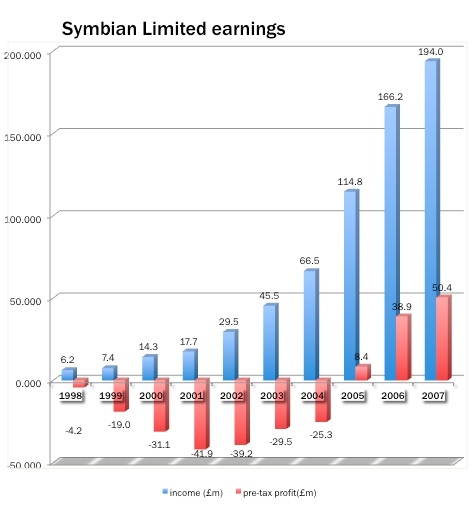 Symbian rapidly grew from 130 staff to 800. Psion had traditionally recruited brilliant problem solvers – often from the natural sciences, mathematics, or practical electronics fields such as audio engineering. A degree wasn’t necessary, nor was a familiarity with Psion, or even computing. This changed. “As Symbian [became] increasingly Nokia's company it got pushed to hire lots of graduates, and moved away from hiring real scientists with real brains, to graduates with some Symbian experience. The product-driven creative people left,” recalls one. One product manager, who was working on a vital product for a large Nordic manufacturer and shareholder, recalls being ticked off for running up a monthly phone bill of £1,200. Another executive recalls getting into trouble for “daring to suggest that WAP was a folly, and was doomed. I was hauled in front of various people and told to toe the line,” he remembers. The pressure mounted on the father of the OS, Psion visionary Colly Myers. He sustained a year of hostile executive board meetings, until Nokia forced its way, according to executives. "It was no fun being in the senior management team. The supervisory board constantly overruled the CEO; they removed his ability to run the company,” Simon East remembers. Symbian would never make a public share offering - a move which would have given the venture real independence. Not surprisingly, Nokia consistently vetoed an IPO. Yet at the height of the 2000 bubble, analysts valued Symbian at £4bn, based on an extrapolation of Psion's 31 per cent stake. Staff made their own calculations, putting the value even higher. The logic here was an examination of P/E from the company most like Symbian, which was reckoned to be ARM. At one point, according to this calculation, Symbian was worth £11bn. In June 2000 Symbian said it wished to IPO on NASDAQ. Symbian didn't float, and the bubble valuations didn't last. In April 2002, Samsung bought a 5 per cent stake for €22m, valuing it at £268m. In February 2003, Samsung bought 5 per cent for £17m, placing the value at £340m. In December that year, Merrill Lynch offered a figure of £240m. Two months later, Psion proposed selling its stake in its entirety to Nokia , sparking a shareholder rebellion. This threw up some fascinating background material, now forgotten, where Psion chairman Potter hinted at deep shareholder disagreement, and disclosed another doomed attempt to take Symbian public. After some canny footwork from Symbian CEO Levin, three other shareholders pre-empted the deal, increasing their stakes. Nokia acquired control of Symbian in 2008. The year-end balance sheet showed accumulated losses of £159m, although the company had been generating fast-growing pre-tax profits since 2005. The final net book value recorded was £64.6m. “The politics got really, really annoying,” he adds. “I couldn’t see how we could do anything innovative. They'd be swooped upon and done by the licensees." Nick Healey had left in 1999. East left in February 2000. Juha Christensen the following month. Scott Jenson left in July 2001 after Nokia killed Symbian’s only home-brewed UI design, Pearl. Randall left for personal reasons the same year. Most controversially, Christensen joined arch-competitor Microsoft, leading to Psion pursuing a High Court action to enforce his contractual gardening leave. CEO Myers put a positive spin on it when interviewed in June 2000: "Well, obviously he knows a lot about our plans. We've put him on gardening leave for six months and say, well in six months our products will be on the market and the world will have moved on." "Nokia is annexing this country, we thought", remembers Christensen. "The other neighbours are willingly accepting it. To us that was insane. Once that happened there was no turning back." "I like Colly and felt bad about putting him in this position. I still feel bad about it today," he recalls. Myers himself left suddenly in February 2002, shortly after a particularly tumultuous period - the capture of the UIs by Nokia and its decision to license Series 60, and the vexed issue of renegotiating the licence fees. Symbian wanted code - Nokia wanted to pay lower royalties. The first mass market Symbian smartphone only emerged in the summer of 2002, four years after the venture set sail. This was the Nokia 7650, based on Nokia’s paint-still-wet Series 60 user interface. Still, the second phone was delivered speedier than the first, and by 2003 a number of products were hitting the market, including Nokia’s game console, the ill-fated N-Gage, and two Sony Ericsson Quartz phones within a year. The first was impressive, the second, the P900 was a dramatic improvement, and was a critical and popular success. Samsung and Siemens joined that year. Despite Series 60, and with a far more defined role, Symbian was back on track. Much of Symbian's recent history is familiar to readers, and beyond the scope of this article, which looks at formative decisions between 1998 and 2001. After the release of Nokia's 7650 - the first real "Symbian smartphone" in 2002, the system gained increasing momentum. 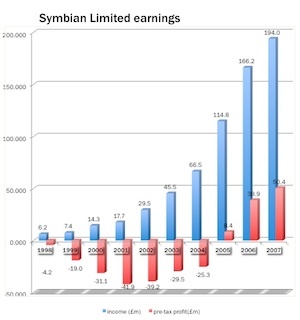 It was no longer a "platform" - but Symbian remained a formidable base system, particularly after the EKA2 kernel revision, and the company was established as the leading consulting and development house for smartphones. Symbian's momentum was driven by Nokia, and a clutch of Japanese manufacturers such as Fujitsu, Sharp and Mitsubishi, who took the Symbian OS kernel and some frameworks, and developed their own UIs on top, as specified by their Japanese carrier customers. The latter devices were never marketed outside Japan, making their sales figures particularly impressive. The other shareholders were much more tentative. Sony Ericsson released two Quartz-derived devices in 2003, the second of which is widely regarded as the best Symbian smartphone - the P900. But Sony Ericsson focussed instead on its feature phones, to great success, until 2008; its Symbian "flagship" was never joined by a fleet. Panasonic would not release a Symbian phone until a couple of lacklustre models in the mid-00's. Motorola released a couple of devices, sold its Symbian stake in 2003, but then resumed licensing in 2006. Siemens released just one Symbian handset. Samsung was even less committed than Sony Ericsson, and only a handful of devices ever reached Europe. So Nokia dominated the market share outside Japan, and released dozens of Symbian phones, successfully integrating the components into its "software factory". But Nokia never succeeded in creating a mass market for smartphone applications or content, which arrived in the wake of the iPhone. In 2008, Nokia bought Symbian outright, and licensed both the Symbian code and its own Series 60 (now S60) code to all-comers for free under an open source licence, to be managed by a Foundation. But Nokia had neglected the smartphone user interface for years, and the move failed to win new licensees. Nokia dissolved the Foundation last month. The future licensing conditions for the source code remain uncertain. Next page: Could Symbian have led the industry?